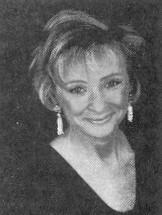 Sue Yackel, soprano, holds a Bachelor of Music Degree with High Honors from the University of Texas at Austin and Master of Music Degree in Voice Performance with Highest Honors from Southern Methodist University in Dallas. Enjoying a variety of performance venues, she has sung the title role of Carlisle Floyd’s Sussanah and Mozart’s Susanna in The Marriage of Figaro as well as having performed the leading roles in musical theatre productions including Oklahoma, My Fair Lady and The Fantastics. In the field of sacred music, she has been soloist in Brahms’ A German Requiem, Mozart’s Mass in C Minor, Handel’s Messiah, Vivaldi’s Gloria, Mendelssohn’s Elijah, Haydn’s Lord Nelson Mass, Faure’s Requiem and Rutter’s Requiem. In 1996 and 1998, Ms. Yackel was soprano soloist with the Morris Beachy Singers on concert tours in Europe. She is currently on the music staff of Valley Presbyterian Church of Brookfield, CT.